Wait. 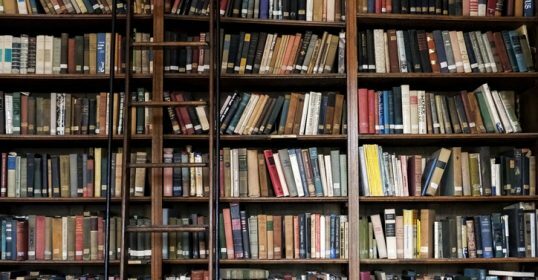 Before you begin reading this post, click play on the video below. Ah, that’s better. Now we’re ready to proceed. But how many of us have actually partaken in this holiday tradition? If you’ve never had a warm roasted chestnut, you’re missing out. Chestnuts grow from mid-fall to early-spring, and they peak during the holidays—which is why they’re associated with this time of year. They have a texture kind of like a baked potato, and they’re the only nut that contains vitamin C, so eating some is a good way to ward off winter scurvy if you’ll be spending Christmas sailing as a pirate. The sweet, nutty flavor of chestnuts will warm your manly holiday spirit to the core, and most importantly, roasting them gives you an excuse to do something with fire. Yes, you can roast chestnuts in the oven. But what would be the fun in that? 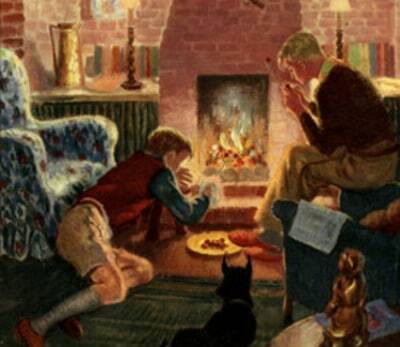 A man never misses a chance to build a fire and cook over it. To roast your chestnuts, you’ll need a pan that you can put into the fire. 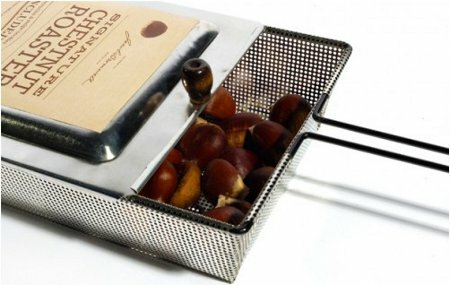 Long-handled popcorn or chestnut roasters make the ideal vessels for open fire chestnut roasting, as they allow you to roast the nuts without burning your face off. And their lids let you shake the chestnuts around for even roasting, instead of having to turn them over yourself or losing a few when flipping them in a lid-less pan. If you don’t have a long-handled roaster, you can get by with a 12-inch cast-iron skillet or some other pan. Just be careful not to burn yourself. If you have an old beat-up skillet, you can turn it into a bona fide chestnut roaster by drilling 30 or so holes in the bottom. 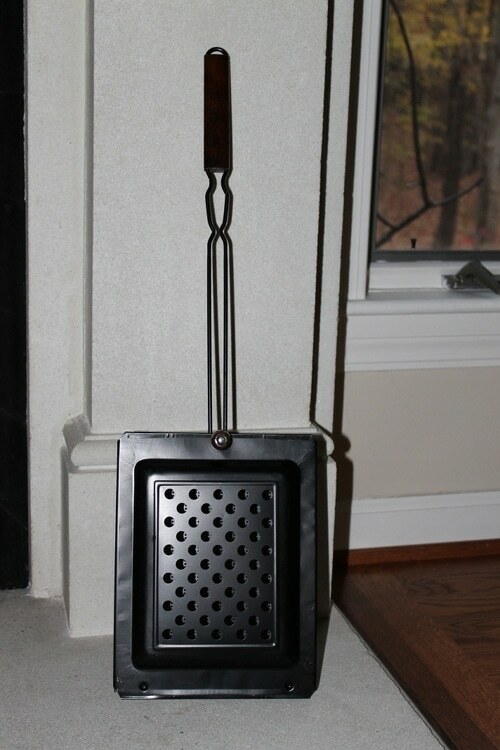 If you don’t have a chestnut roaster or a skillet, you can also use a fireplace shovel. And I suppose you could even try sticking them individually on skewers like the boys in the opening image, if you’re the patient type. You can buy chestnuts at some grocery stores, but you may want to call ahead to make sure they have them. 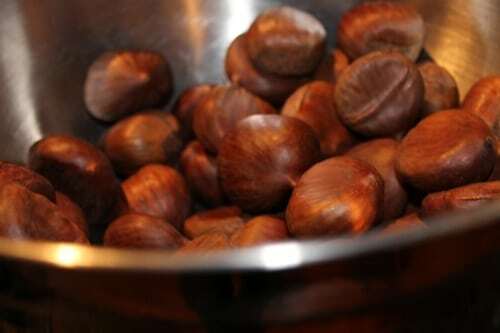 While dozens of chestnut varieties exist, most people roast Castagne and Marroni chestnuts at the holidays. Castagne are more common, while the Marroni are a more expensive specialty. 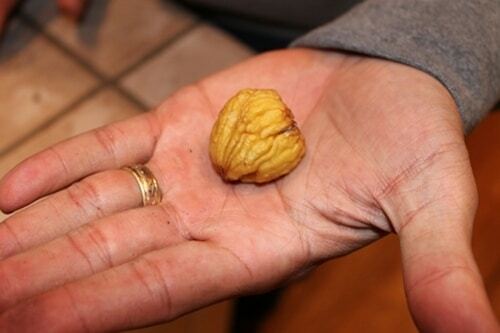 The nut of the Marroni is sweeter and plumper, and it peels away from the skin more easily. When choosing your chestnuts, look for those that are plump, smooth, shiny, and blemish-free. Moldy chestnuts are a common problem, so squeeze and shake the chestnut to see if the nut has shriveled up and pulled away from the shell. 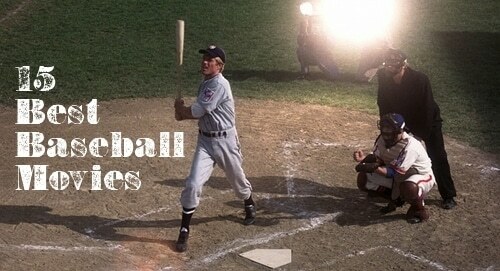 Keep in mind that the larger the chestnut, the longer it will take to roast. Pick chestnuts that are fairly uniform in size and will thus be done at the same time. Rinse the chestnuts under cold water. 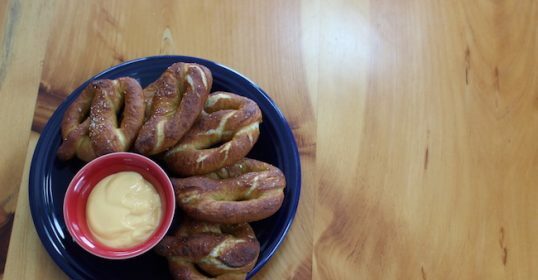 Lay them on a towel and pat dry. 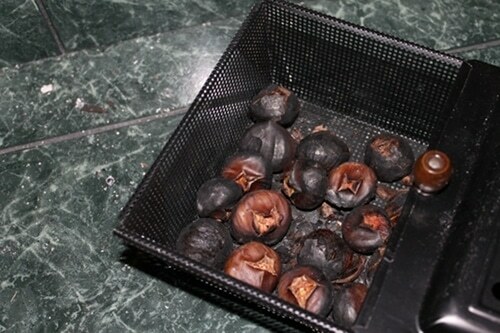 Before roasting chestnuts, you must score them to allow steam to escape and prevent them from exploding like chestnut bombs while cooking. Simply take a sharp knife and cut an “X” into the flat side of each chestnut. 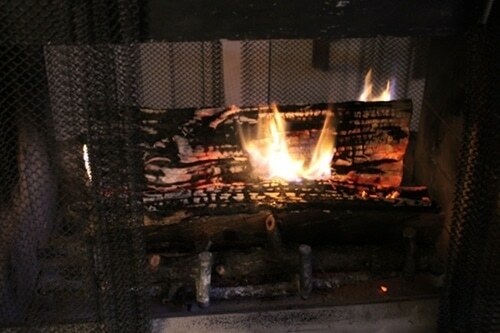 Once your chestnuts are clean, dry, and scored, build a warm, cozy fire in the fireplace. Let it burn down so that you have a nice bed of hot embers. 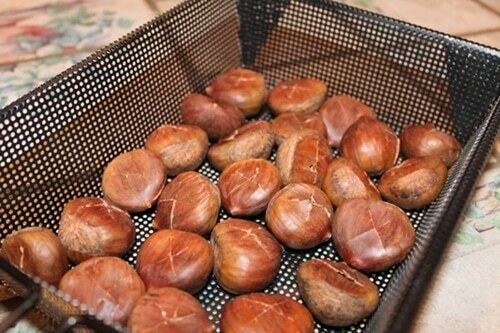 Place the chestnuts in a single layer in the pan. No need to add oil or grease; as they cook, the chestnuts will release their own oil. Cover the pan with a lid and hold it over, but not directly in, the fire. After five minutes or so, shake or stir the chestnuts around, making sure to roast all sides adequately. Repeat this process every few minutes. I didn’t have time to wait for a proper ember bed, so I did stick the chesnuts directly in the fire somewhat, even though it isn’t reccomended. The outsides got charred, but the insides were mostly okay. Most chestnuts will fully roast after 25 minutes. 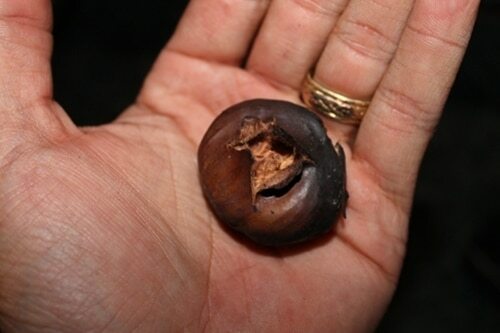 A chestnut is fully roasted when the shell starts to open where you made the score mark and you start hearing popping noises. 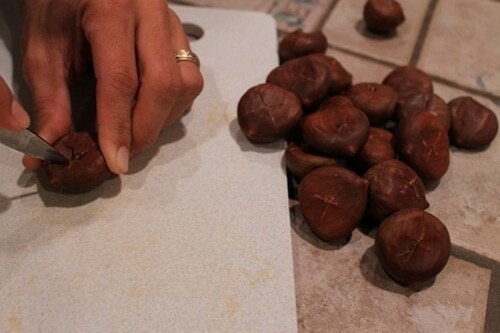 You can also check for doneness by piercing a chestnut with a knife; it should be tender. 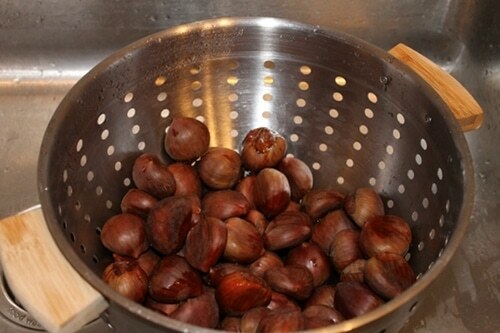 Remove the chestnuts and place them in a towel-lined bowl to cool for about 10 minutes. While they’re still warm, remove the shells. The fuzzy inside skin will peel off along with the outer shell. You can eat the chestnuts plain or dip them in butter and cinnamon for extra holiday flavor and goodness. The folks at Jacob Bromwell sent me one of their chestnut roasters so I could fulfill my dream of finally trying this classic holiday tradition. And they also offered to give away one of their roasters to a lucky AoM reader as well. Established in 1819, Jacob Bromwell is America’s oldest cookware company. All of their kitchen and campfire cookware is handcrafted and made in America, just like it was almost 200 years ago. And all their products are backed by a lifetime guarantee. 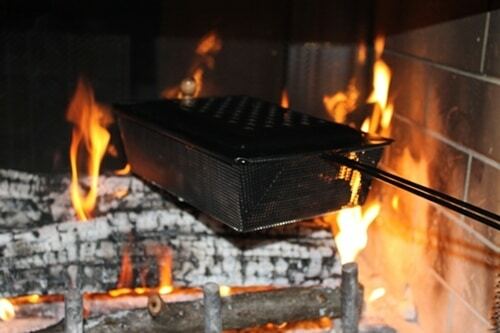 Their sturdy, authentic chestnut roasters have a nice wooden handle to keep your hands cool, and they can also be used to pop popcorn in the fire, if chestnuts aren’t your thing. The roaster will surely be enjoyed by your family for decades of holiday fun. Entering to win one of these old fashioned roasters is easy. Just leave a comment giving us your thoughts on chestnuts or simply sharing your favorite holiday tradition. 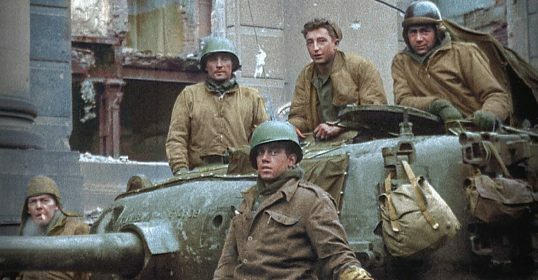 Contest is over. Winner will be selected shortly.